York-based insurance company The Insurance Emporium recently took part in the Micklegate Soapbox Challenge to fundraise for assistance dogs charities, including Canine Partners. 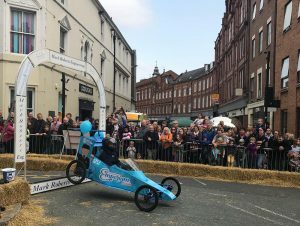 York-based insurance company The Insurance Emporium recently took part in the Micklegate Soapbox Challenge to fundraise for assistance dogs charities, including Canine Partners. The event attracts around 20,000 visitors per year. 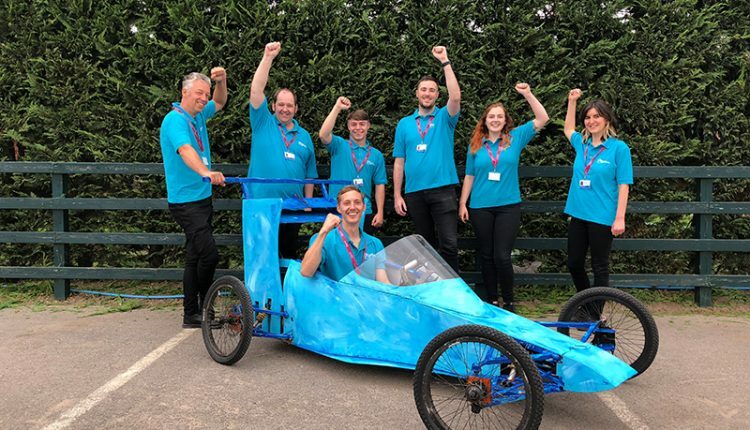 The challenge was a first for the company, but they worked hard to create a kart capable of reaching up to 40 miles per hour, in their bid for glory and to help raise much-needed funds for us as well as other ADUK charities Dogs for Good, Hearing Dogs for Deaf People and Medical Detection Dogs. The Insurance Emporium kart featured the company’s turquoise branding with the famous Mr Benn mascot wearing his bowler hat. The kart was hand-painted by The Insurance Emporium team and was fully test-driven and safety-tested before the big event. Other kart designs included a fully-made bed, a Victoria sponge cake and a coffin design from York Dungeon – who ended up winning the coveted award of first place. For their very first attempt, placing in the top third of 43 teams racing was a fantastic achievement by The Insurance Emporium. Through the fun challenge, they were also able to reach the 25% mark of the team’s total fundraising target in only a few days. They are aiming to raise a total of £100 per charity. You can donate to their JustGiving page here. A big thank you to The Insurance Emporium for all of their hard work and support. You can read more about The Insurance Emporium’s charity involvement on their website.